Perhaps you’re looking for different ways to wrap your gifts, either to make them a little more personal, or to customize them. Or maybe you’re tired of carrying mounds of paper, ribbon and bows to the trash can after every holiday and celebration, and want a more sustainable approach. Here are some creative ideas to inspire new choices for your next round of gift wrapping. Reusable shopping bags come in a huge variety of colors and patterns, and they’re easy to find. You have many choices for Christmas wrapping beyond red and green bags. Select instead a stylish design and print that reflects the personality of your recipient. As a bonus, once the gift has been removed, the bag folds up for easy storing, making it handy for shopping. Wrapping with a reusable shopping bag is as simple as placing the gift inside, and bunching one or two pieces of tissue paper on top to cover it. Tie the handles together with a ribbon, and attach a gift card on the handle or side with a small binder clip, or colorful clothes pin. If your gift is in a box, and you want a tightly wrapped look, follow these instructions. 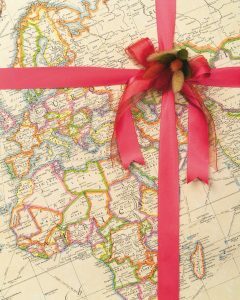 Use road maps, or any type of map which has meaning for the gift recipient (e.g. world maps, country maps, solar system maps, fantasy world maps). Highlight routes to favorite destinations, circle meaningful cities or areas, and finish by tying a ribbon around the package, or adding a bow. This type of wrapping has such visual interest that it may take a while for the person to actually open his or her present. This is the activity where you can unleash your creative side. First, you’ll need to purchase some supplies: 2 kinds of craft paper (black and white), brown butcher paper, glue gun, washable chalkboard markers, paintbrush, bows, yarn, gold rope, and items which will be fun to stick on your wrapping paper (e.g. buttons, pompoms). Also, be sure to pick up some washi tape, a type of decorative colored adhesive tape. You’ll want a variety of colors and patterns. Use the black craft paper to create a chalkboard-style wrap. Draw designs, write messages, add the “to” and “from” names, all with a white marker. Finish off the wrapping with some white yarn tied around the package, and top it with a white bow. You’ve just created a striking looking gift, with a personal touch. Another fun wrap is the watercolor one, which the kids will enjoy as well. Wrap the gift in white craft paper, then create designs on it with the markers. Paint over these marker designs with a brush dipped in water, creating instant watercolors. Add a bow or gift topper to finish it off. If the paper’s thin and you’re concerned about bleeding, do the watercoloring before you wrap.